Sam Phran, Thailand 2012: No Mowgli here, just Phil, myself and MAX. No Shere Khan either. We've got Mr. Oil and Mr. Lift instead. Hathi and his sons are not around but a small soccer team of his cousins are getting ready for the big game. Then there's a whole section of the park for Jacala's family. Not to mention all the other animals that could be a foil for the cast of Rudyard Kipling's original Jungle Book. first traffic light tree in Asia. See the lights for the elephants? For those who haven't read the Jungle Book, one of the most popular tale in the book takes us to India, where the adventures of a boy raised by wolves (Mowgli), interacts with the various animals of the jungle. Not all are as good as Hathi (the elephant). Jacala (the crocodile) and Mowgli's arch nemesis Shere Khan (the tiger) have their own share of villany. Entrance fee including all shows: Adult 600 baht, child below 130 cms. 350 baht. Open daily from 08:30 - 17:30 hrs. 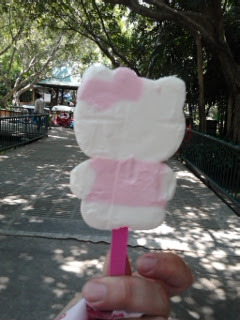 various snack bars dot the place, selling chips, candies, drinks, ice cream and even Thai street food on sticks. they're also reasonably priced, if not close to the prices outside the zoo. **the zoo's staff are always around and oftentimes, they have a camera on hand to document your animal interactions. Your pictures may then be printed out on commemorative plates (with stand), a Polaroid snapshot will be handed out to you or printed on t shirts as well. The plates and shirts cost around 150 baht each. 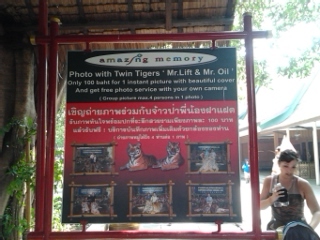 The Polaroid shot on the other will be given to you should you want to have your picture taken with the twin Siberian-Bengal tigers close to the entrance. Elephant Encounter: on their downtime, the elephants try to earn some extra bananas and sugarcane as well as some real cash for their trainers. Walking through the grounds, you may find elephants (chained) chilling near booths that sell the aforementioned pachyderm treats. You can also have your photo taken with them. Just tip the trainers. 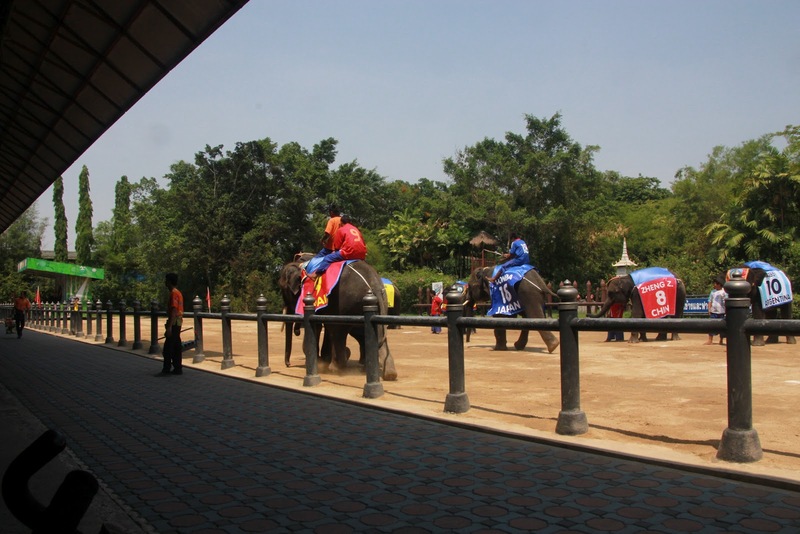 The Food stalls for the elephants have bundles of sugracane and bananas that cost 10 baht each. As expected, those big boys can eat a whole lot! Crocodile Wrestling Show: two young men and 6 medium sized crocodiles in a closed off mini pool! Try to go to the show venue 30 minutes earlier to get a good pick of the viewing area upstairs. There are souvenir shops there to check out as you wait for the show to start. Show was exciting. The whole head inside a crocs mouth thing and more were done. It was so exciting that we opted to shot a video of the show rather than take stills. Will try to upload an edited, shorter clip soon! The Elephant Theme Show: prior to the elephant show, there is a magic show that starts right after the Croc Wrestling program. We opted to skip the abracadabras and rode on an elephant instead. More on that in a few. 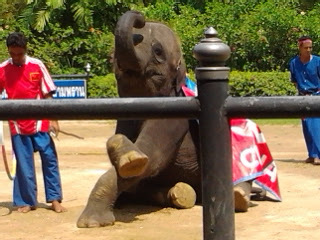 As for the Elephant Theme show, this is probably the highlight of the place. 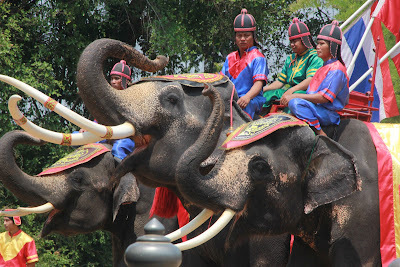 The huge residents of the zoo " dance, race, play football and games, perform the“Yutha Hathi” ( a great royal battle scene), that is even performed with the actors riding on the elephants. " Entertaining, educational and awesome, this is one show you can't miss. Drinks and food are also sold in the venue, as well as ice cold face towels in sealed packs. Just the perfect thing to wipe away the sweat. By the way, while staying at the front row may be great for your vision, the battle scenes and the explosions in the show (as cools as they are) may frighten young children. fearing for MAX's safety, it was quite ironic that he was the one who had the most fun in the while ride! 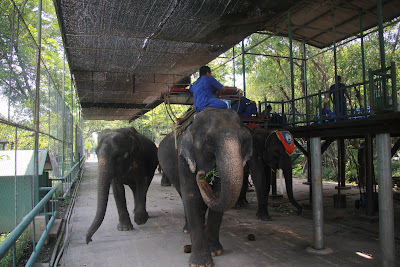 The Elephant Ride: for 500 baht/person (paid at the entrance of this attraction), you could get to ride the bigger elephants in the group. The ride lasts for about 30 minutes (but to a person with a fear of heights, the ride seemed to last forever), as a trainer maneuvers your ride around the garden. The garden in itself is quite pretty. A waterfall, a pond and an orchid nursery are some of the things to see from above. As a safety precaution, no taking of photos during the ride is advised. You gotta hold on for dear life. No kidding!!!). The seat itself is a sturdy plank with metal bars at the back to lean on and handle bars at the sides to hold on to. 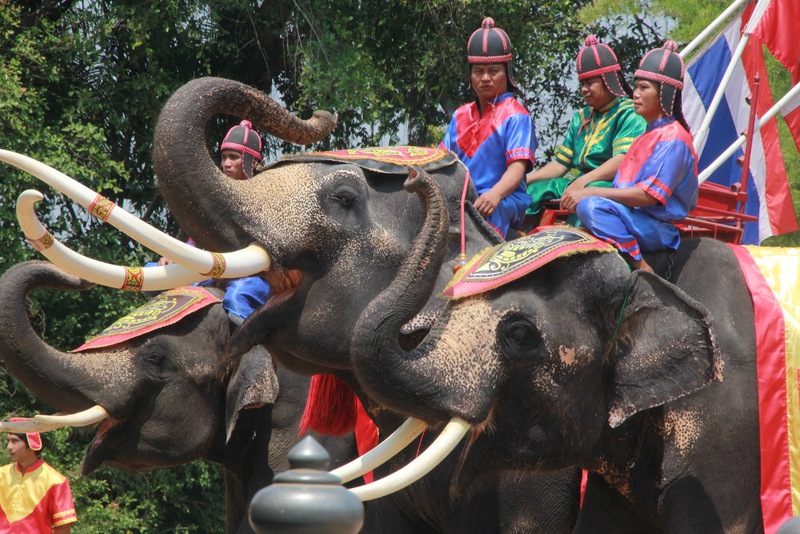 The seat is strapped down over the thick blankets placed over the elephant's back. There are no harnesses, no seat belts. Just you, and your will to live. To get on and off this breathing ride, a one storey high platform is there for your convenience. The scariest part of riding an elephant this big (specifically the pregnant pachyderm we rode on), was when the elephant decided to try and get off the path and pull plants from the ground. I broke into a cold sweat and was torn between crying or laughing hysterically from the fear. Other than that, it was a wonderful experience! Fish feeding and boat rides with..guess what...more fish feeding :P- fish food (actually dog food pellets) are sold at the snack kiosks at 15 - 20 baht a bag. The pellets would make your hands smell weird, and the faucets around the area dump the water back into the pond, so good luck on using soap. (sorry mutant catfishies. I used some soap-free hand wash from the Bodyshop coz the smell really bothered me). 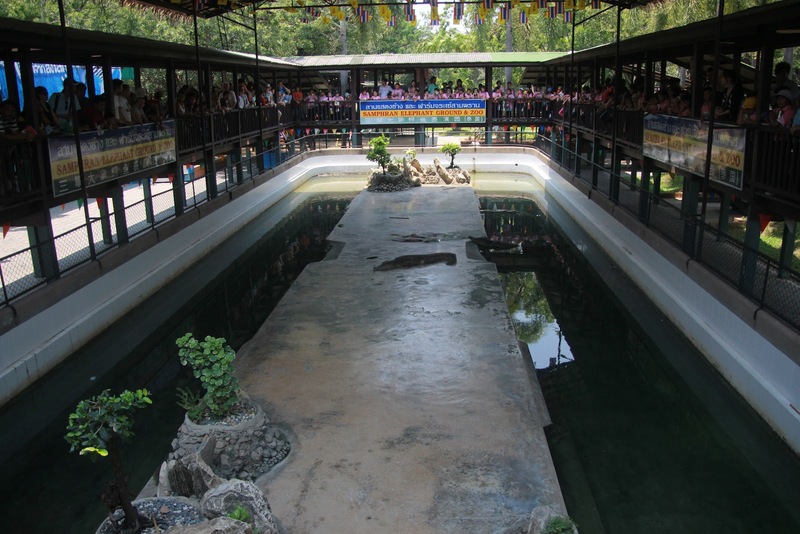 The pedaled boat ride is also around for you to get closer to the fish and feed them. The Zoo: lots of mammals and reptiles around the place. Didn't get to take pictures of em, but they're there! This place was probably the highlight of our trip. We had so much fun, that we stayed a little bit longer, and ended up missing a good part of the cultural show at the Rose Garden. But that's another story, for the next blog. THE CHAO PHRAYA CANAL TOUR: Reasons To Say NO!